As the Senate works toward a compromise on immigration reform, the emerging proposal addresses two widely-held public goals. Broad majorities – across party lines – continue to support a path to legalization for undocumented immigrants. And large majorities also say this legislation must include increased border security. But the public is divided on an issue that has been among the most contentious in Congress – whether border security must be achieved before the process of legalization can go forward. The national survey by the Pew Research Center and USA TODAY, conducted June 12-16 among 1,512 adults, finds that 43% say that people in the U.S. illegally should be allowed to seek legal status only after effective border control is established, while 49% say this can occur while border security improvements are being made. 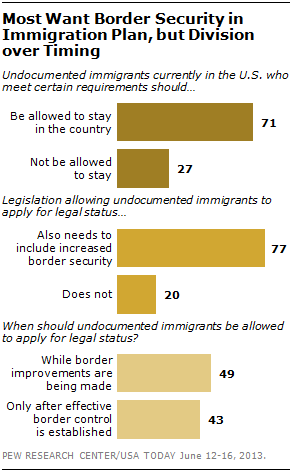 Republicans and Democrats are on opposite sides of this issue: 60% of Democrats say border improvements and applications for legal status can happen at the same time, while a majority of Republicans (56%) say the borders must effectively be controlled first. Yet there also are substantial differences within both partisan bases. 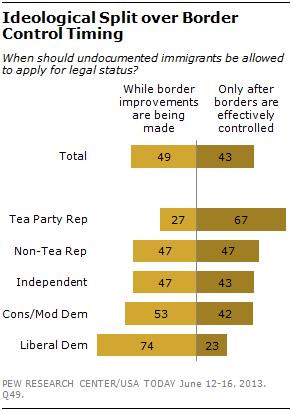 Republicans who agree with the Tea Party favor a “border security first” approach by more than two-to-one (67% to 27%). Non-Tea Party Republicans are divided (47%-47%). And while much of the focus in the congressional immigration debate has been on the GOP’s divisions, internal differences among Democrats are just as wide. Liberal Democrats, by 74% to 23%, say the process of applying for legal status should go forward while border security is being increased. But only about half (53%) of the party’s conservatives and moderates agree. Perceptions of the nature of the border problem factor into public views on this debate. The survey finds that a majority of the public (55%) believes that the number of immigrants entering the United States illegally is higher now than it was 10 years ago while about four-in-ten believe it is the same (27%) or lower (15%) today. Those who believe the illegal immigration rate has risen are more likely than others to say legal status should come only after improvements are made to border security. There is no definitive measure of illegal immigration into the U.S., but recent studies by the Pew Hispanic Center have found that there has been a decline in the number of undocumented immigrants in the U.S. in recent years and net migration from Mexico (inflow minus outflow) has fallen to zero, and possibly lower. And while an imperfect measure, U.S. Border Patrol records also show sharply fewer illegal alien apprehensions than a decade ago. Most Americans believe undocumented immigrants should meet certain requirements before they are allowed to stay in the U.S. legally: 56% say undocumented immigrants should have to pay fines before gaining legal status. A similar percentage (55%) backs a 10-year waiting period for most immigrants before permanent residency. There is much broader support for another requirement – fully 76% of the public, including majorities of nearly every demographic group, say that undocumented immigrants should have to show they can speak and understand English before being allowed to stay in the U.S. legally. The survey finds that large majorities of the public agree with a number of statements – pro and con – about the possible impact of granting legal status to people in the U.S. illegally. Fully 77% agree – including 57% who strongly agree – that deporting all undocumented immigrants would be unrealistic. By comparison, larger shares of the public agree with other concerns about creating a path to legal status, such as that it would encourage more people come to the U.S. illegally (64%) and would be a drain on government services (61%) . Broad majorities of Republicans agree with some of the arguments made by proponents of a legalization path: 76% say deportation is unrealistic, and 70% say it would be better for the economy if undocumented immigrants had legal status and were legal workers. But Republicans are far more likely than Democrats to see potential downsides from granting legal status to undocumented immigrants. In particular, 77% say this would encourage more illegal immigration, and 72% say it would be a drain on government services – concerns about half of Democrats share. Roughly two-thirds of Republicans believe a legalization program would reward illegal behavior and would take jobs from U.S. citizens, views that only about four-in-ten Democrats share. The issue of immigration reform has set off intense debate among GOP leaders over whether the party would be better served politically if it supported legal status for people in the U.S. illegally. 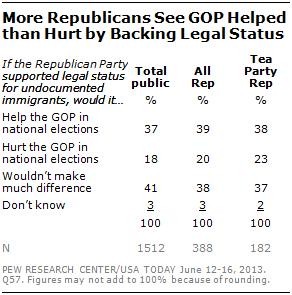 Among Republicans, 39% say that supporting legal status would help the party in national elections while 20% say it would hurt the party politically and 40% say it would not make much difference. Notably, while Republicans who agree with the Tea Party express greater concern about undocumented immigrants, they have about the same view as all Republicans regarding the implications for the GOP if it supports legal status.